13/05/2013 - Prime Minister Pedro Passos Coelho addressed the OECD Council of Ambassadors (Read his speech) and met with senior OECD officials to discuss ways to boost productivity, improve skills and create jobs, and the role of the state in supporting inclusive growth. The OECD’s new report, Portugal: Reforming the State to Promote Growth, will be the basis of their discussions. 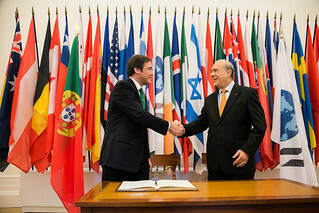 Prime Minister Passos Coelho and OECD Secretary-General Angel Gurría held a news conference at 12:30 on Tuesday 14 May. Watch the webcast of the press conference in English, French or Portuguese. To attend the news conference, journalists must register with news.contact@oecd.org or by calling + 331 45 24 97 00.